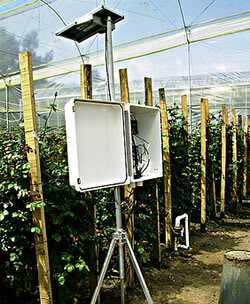 Crop Water Stress Index is a means of irrigation scheduling and crop water stress quantification based on canopy temperature measurements and prevailing meteorological conditions. Plant temperature is an indicator of plant water status because stomates close in response to soil water depletion causing a decrease in water uptake and an increase in leaf temperature. Precise measurements, particularly canopy temperature, are required. Apogee Infrared Radiometers have been used by Dr. Suat Irmak, of the University of Nebraska, in his CWSI research. Read the full journal article Payero, J. O., S. Irmak. 2006. Variable upper and lower crop water stress index baselines for corn and soybean. Irrigation Science, 25 (1):21-32.